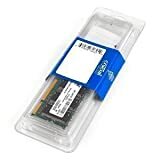 Ram Memory Upgrade 4GB for the Apple iMac 2.66GHz Intel Core 2 Duo (24-inch – DDR3) Desktop/PC. Each memory slot can hold DDR3 PC3-8500 with a maximum of 4GB per slot. Need help finding information about your Mac’s memory? In the Contents section on the left side of the screen, click Memory. The Memory Slot information appears, showing your current memory configuration. This information helps you determine which slots are filled with which type of memory, and how many slots are still available to install new ram memory. This entry was posted in Computer Desktops and tagged 2.66GHz, 2009, 24inch, Apple, Core, DDR3, Desktop/PC, Early, Identifiers, iMac, iMac91, Intel, MB418LL/A, Memory, Upgrade by Express Computer Supplies. Bookmark the permalink.